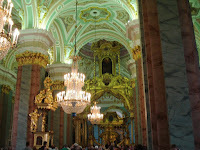 Two more cathedrals rounded out our tour of St. Petersburg. 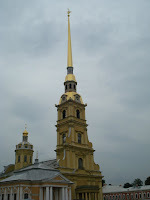 St. Isaac's, which is a landm ark structure of St. Petersburg, and Peter and Paul Cathedral within the Peter and Paul Fortress. 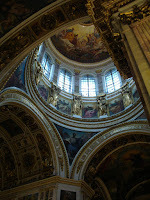 St. Isaac's Cathedral is an imposing building that sits on one end of the square named for the cathedral. In the middle of the square is an equestrian statue of Peter the Great, the city's namesake. The impressive dome is covered in gold and can be seen from quite a distance in the Gulf of Finland. The cathedral was first built in 1707 during the reign of Peter th e Great but was reconstructed four times. The last was built between 1818 and 1858. 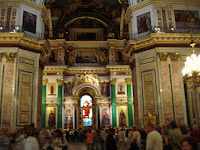 Restoration of the cathedral which suffered extensively from the Bolshevik regime and WWII and the elements, began in 1947. Today the cathedral is used as a museum and for religious services on significant holidays. Those who attend orthodox services stand for the whole hour. This cathedral can accommodate 14,000 standing worshipers. After admiring the icons and the mosaics and the gilded altar and various precious stones and materials that went into the pillars and artwork, we found a brass plate in the middle of the floor which signified the center of the dome. 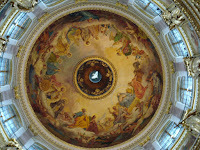 Looking up from there, we could see the tribute to the Holy Spirit in the form of a dove. As we crossed the bridge to the island where the Peter and Paul Fortress sits, it began raining a bit harder. Under the protection of our umbrella, we tramped through the fortress gate and into the inner courtyard where the cathedral sits. What could this cathedral hold that we hadn't already seen in other? Upon entering, we discovered that this was the building that housed many of the tombs of past tsars and their families and of course the most recent and last of the ruling families, the Romanovs. 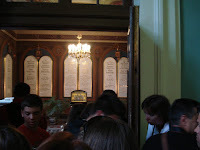 A room is devoted to their remains as well as those of the faithful servants killed with them. There remains were discovered and moved to the cathedral in 1998. One of the unique things we found here was in the columns of the cathedral. Materials must have been scarce or too expensive but for whatever reason, the columns inside the cathedral are faux marble. The y are done so well that you don't even notice until you get close or someone points it out. 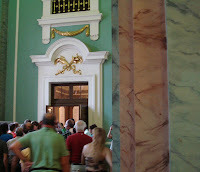 See the columns in the left picture here just outside the Romanov room. Our guide and driver returned us to our ship with a little less than an hour before departure time. We were grateful for the closer glimpse we had of St. Petersburg this time but still resolved that there is much more to be seen and appreciated. Yes, we will be planning a return trip.